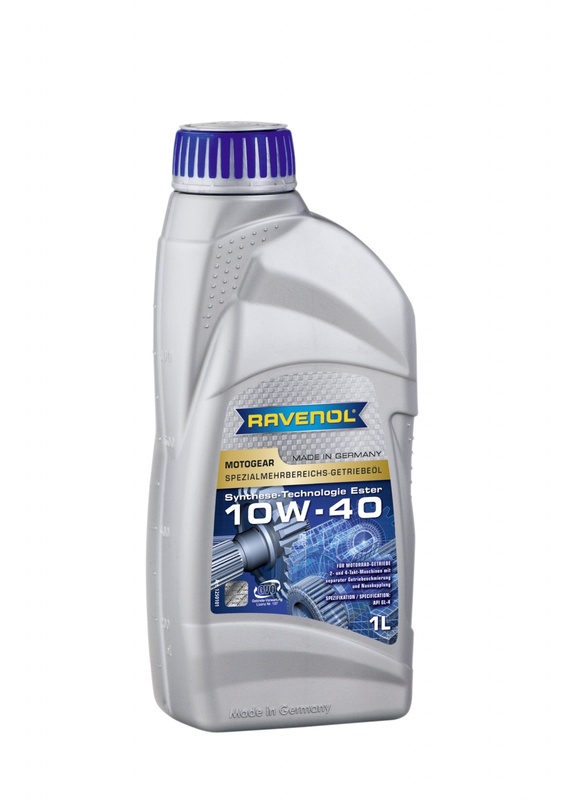 RAVENOL Motogear SAE 10W-40 GL-4 is a special multi-grade motorbike gear oil based on the latest ester based synthetic technology specifically formulated for easy operation even under extreme operating conditions. Designed for use in both 2-and 4-stroke bikes with separate gear lubrication and wet clutch, it allows accurate and smooth shifting and prevents the clutch slipping. Forms a highly resistant lubricating film which protects under all operating conditions. RAVENOL Motogear SAE 10W-40 GL-4 is suitable for use in Japanese and European motorbikes, both 2- and 4-stroke, where separate gear lubrication and wet clutch capability is required. Fast lubrication and rapid circulation under all operating temperatures. Heavy-duty lubricant film under all operating conditions. Precise, smooth shifting, no clutch slippage. Excellent detergent and dispersant capabilities and a high resistance to aging.